The Kailash temple is not built. 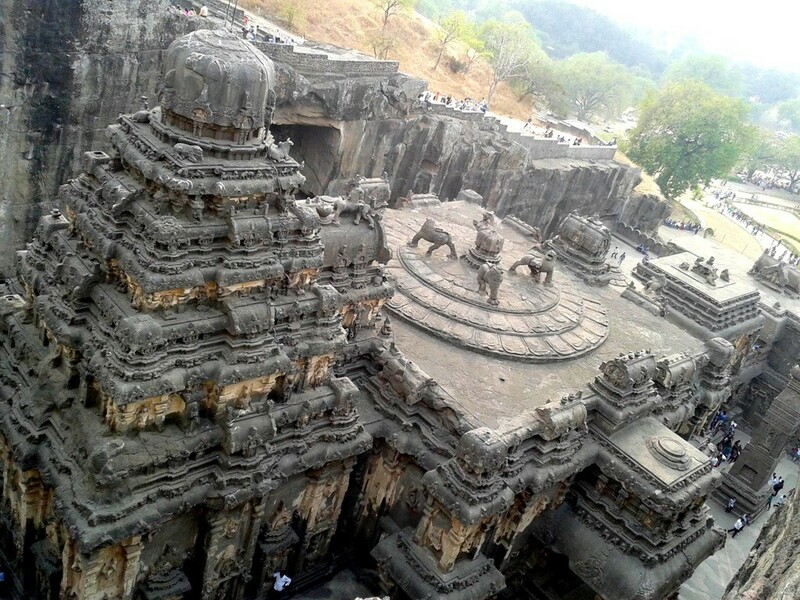 All is cut and carved from one gigantic piece of rock, hewn out of the Charanandri hills of the Sahyadri range of the Deccan Plateau at a village, which once was called Elapura, (later renamed as Ellora by british), 30 km northwest of Sambhajinagar (aurangabad). The Kailash temple was cut from the top down in a U-shape form, about 50 Meters deep in the back and sliding to lower levels on the sides to the front where there is an entry gate. From where the cutting was started is not known, definitely it could be from the Ganesh Dwar (every Hindu temple has a place that is dedicated to Bhagwan Ganesh, Son of Bhagwan Shiv), but later were the de-pilings done simultaneously or step by step – nothing is clear even after deep research conducted by several experts. After deeply analyzing the amount of man-hours and efforts involved, experts summarized that the scale at which the work was undertaken is enormous. It covers twice the area of the Parthenon in Athens and is 1.5 times high (and bigger than all ancient temples of the world), and it entailed removing 200,000 tonnes of rock. It is believed to have taken 7,000 labourers and 150 years to complete the project. Practically speaking with modern technology, given the space and plan around the Kailash temple, it is almost impossible to implement Ten 10-ton JCB machines to remove the rock pieces, as movement of each machine would require space and such huge machines can muffle up lot of space around them, their function is very complicated and when the ground is hollow the machine cannot operate and pose problem in itself. Hypothetically, If the scale of work was carried today, it would have required at least 10 largest ever 10-ton JCB machines to excavate the pieces of rock of 20,000 tonnes by each machine. Each machine is able to excavate 100 tons of rock pieces in phased manner so even removal of 1000 tonnes each day would have taken more than 6 months i.e. 200 days of continous work ! Today building a massive structure like Kailash temple would require pre-design and 3D conceptions using latest CAD softwares and high-tech computers. Imagining how the structure will look at which area we should have distance properly maintained to start carving, where we should pause, which side we should start building entrace, how the internal design be formed. There are hundreds of questions which require answers and only getting resolutions around these queries alone would require several months of hundreds of dedicated designs, 3D graphic artistes and designers who have knowledge of construction and civil work. The precision with which the sculpts can be cut is still not invented by engineers in the world today. So we will need manual labors to minutely carve the temple. It will require at least 10,000 skilled workers to carry out the digging, carving, sculpting and materializing the entire structure as envisioned. The total duration required to complete the task cannot be estimated because till date in modern times, no single mid-size rock is cut to create a temple.